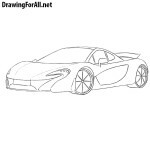 Our readers very often asked us to show how to draw McLaren F1. And now, this drawing lesson is ready, and you only need to start the drawing process. 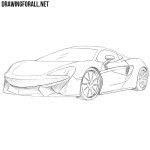 As always, we begin with the basic outline of the body of our McLaren. This is a fairly rounded car, so that the outlines of the body should be made with help of sufficiently curved and smooth lines. Do not try to make the lines too clear and dark, since in the future all lines from this step will be erased. Now let’s add the most basic details to the body of our sports car. In the front part draw the outlines of the headlights. In the lateral part draw the outlines of mirrors, wheel arches and the wheels themselves. 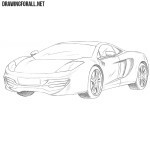 Now our drawing is more like a McClaren, is not it? We continue to add details to the body of our car. In the front part sketch out the outlines of the bumper and the details of the hood. Next, sketch out the outline of the door and rims on the side surface. The basic outlines of the McLaren are ready, now we will detail our drawing and give it a completed look with the help of clear and dark lines. We will begin working with final details from the front. Using clear and dark lines draw out the outlines of headlights, bonnet and bumper. Carefully draw all the details on the front of the car as in our example. All lines must be smooth and clear. 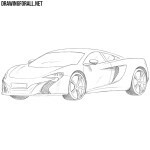 Continue the lesson about how to draw a McLaren F1. Now go to the top of the car and draw out the roof and the outlines of the windows. In the same step draw out mirrors of our car. Now draw a fairly large spoiler in the back of our sport car. Next, draw out the contours of the door of an unusual shape. Remove all unnecessary lines and strokes that we drew in the first three steps. The outlines of the body should look smooth and clean, as in our example. Now one of the most difficult steps in the lesson about how to draw a McLaren F1. Draw out the outlines of the wheels, which must be very smooth and rounded. Next, draw out the rims, which can be as in our example or of any other form. Try to make the rims look voluminous. In the last step of almost all our drawing lessons we add shadows to make the drawing more realistic. With the help of a few strokes we draw the glare on the surface of the windows and the body. Next, add shadows using dense hatching. The lesson was quite complex and long, but the result was worth it, since now you can draw a McLaren F1. That is, in fact, you now have your own McLaren F1, a cool sports car, but there is no problem with repair and car insurance. In fact, all sports cars are quite similar to each other. They have a low roof, a wide body and a larger wheels. So if you have learned to draw this sports car (to be more exact a super car), then you will be able to draw other cars of this type. And if this lesson was really useful and interesting for you, then support us on Patreon and subscribe to us on social networks, it is very important for us.